Hometown Visit: Family, Friends, Lobster, and Clams on Eastern Long Island – Neales…on wheels! 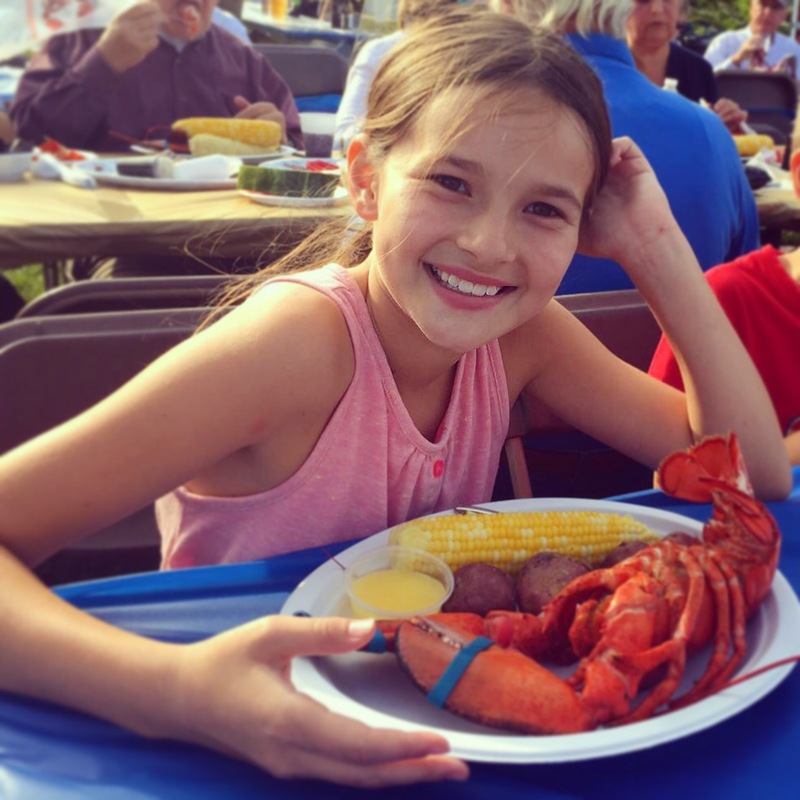 As we gradually made our way toward the East Coast we kept our itinerary loose, with one date in mind: July 28 for Lobsterfest in my hometown of Southold on Long Island, NY. Since Rita’s first bite of lobster at age 6, she declared that it was her favorite food. The name alone for this annual fundraising event held at the beach by the local Rotary Clubs had her swooning. She’s been telling people we’ve met across the country that we were headed to New York to 1) see her mom’s family, and 2) go to Lobsterfest. We made it out to the North Fork of Long Island, via ferry from Connecticut, on July 24 for a monthlong stay at the Eastern Long Island Kampground, just four miles from my parents’ house. My parents were hosting my siblings plus other visitors throughout August so it was good for everyone, including the dogs, to have our own space (with A/C) nearby. Rita and Charlie got to enjoy sleepovers with their grandparents and aunts and uncles, while Chris and I had some alone time for the first time in a long time. Aside from two excursions – to stay with good friends in Westchester County, and visit Sagamore Hill National Historic Site – for the most part we could be found at my parents’ house (the house my four siblings and I grew up in): hanging out with visiting family and friends; meeting our 5-month-old nephew/cousin for the first time; playing in the beautiful yard and relaxing on the patio; coordinating car rides and meals. The kids loved playing in the big back yard. The kids loved having aunts, uncles, and cousins around to rope into wiffle ball and badminton games. I did many, many loads of laundry, and Chris made more than one Costco run. We took Charlie to urgent care twice. Both times, I’m embarrassed to admit, ended up being nothing more than bug bites. (We really aren’t used to East Coast bugs, or their alarming looking bites and rashes!) We went for a sail on my Uncle Paul’s boat, and I stretched out in my sister Christine’s wonderful yoga classes. 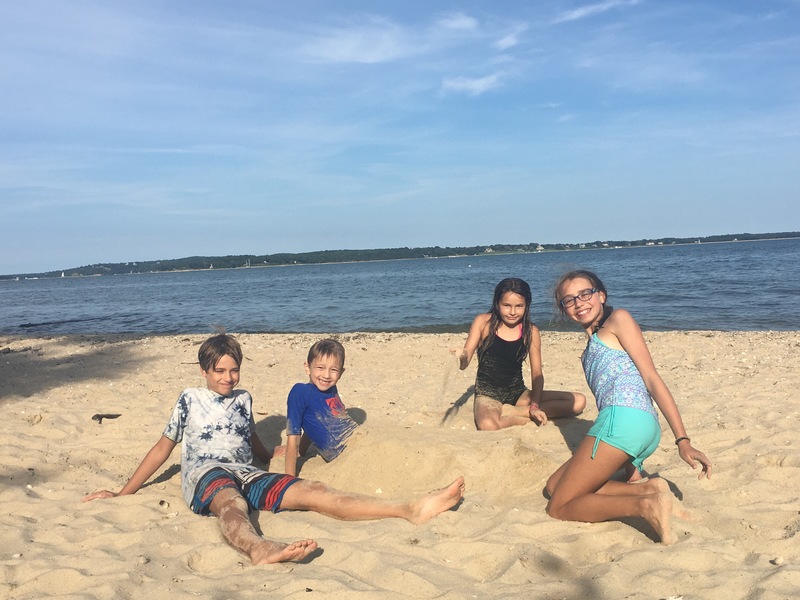 Rita and Charlie learned about the Gagen family’s deep history in Southold, while Chris discovered his affinity for clamming in Peconic Bay, despite growing up in the mountains of Southern California. We went to the beach, alternating between favorite spots at the Bay and Long Island Sound , depending on the time of day and our mood. We visited a few of the many wineries on the North Fork, enjoying a glass with peaceful views of vineyards and farmland. We consumed a bounty of local fresh fruit and vegetables, fish and clams, and the incomparable New York deli breakfast sandwiches. It was wonderful to see so many friends and family, and yet there were still many other good friends, on Long Island and in NYC, that we missed. I feel very fortunate to have grown up in a beautiful place with such a close-knit, if geographically spread out, family. We all love to spend time in Southold, and look forward to returning. All five siblings together for the first time in five years! It was great to get to spend a whole month with Francis (and his parents!) who live in Switzerland. Founder’s Landing, our main childhood beach. Rita stole this clam from a seagull for Granddude. Sipping rose and lemonade with cousin Sara and Aunt Christine at Croteaux Vineyards. Clowning around with Abby, Quinn, and Griffin. Too brief but still great to visit with my childhood friend and her kids: Lucas, Olivia, Maya, and Wyatt. At their great-great-grandfather Gagen’s blacksmith shop at the Southold Historical Society. “Garden tour” with Mike, Micaela, and Claire. Fun times with cousins Griffin and Quinn. That’s Sagamore Hill, Theodore Roosevelt’s estate in Oyster Bay. In all the years I lived on Long Island I’d never been before. What a beautiful and fascinating place. Throwing rocks in the Sound with Grandma Denise. Bocce and eclipse party with Aunt Christine. With Aunt Sheila and his great-great-great-great-great-grandfather’s whaling log at Horton Point Lighthouse. Traveling Circus: the Next Generation. Lobsterfest II with Francis, Aunt Kerry, Uncle Dan, and cousin Claire. The steps at Horton Point Lighthouse and Long Island Sound. Mine too! What a great group of kids, so happy we got to meet. Fun! I just love that area so much. We had dinner at the Pridwin last time we were out there (2015). Rita will be happy to inspire a lobster dinner! Pingback: How to see New York in Three Hours – Neales…on wheels!